Part ten of the 2015 College Football Preview will look at the Big 12. Last year was a rough year for the Big 12 after having both Baylor and TCU left out of the College Football Playoff. Below is the schedule of previews left, as well as the previews already published. Below is a look at each of the ten teams that make up the Big 12. Gary Patterson has led TCU since 2000 when he was the head coach for the bowl game that year. Since then, he has led TCU through Conference USA to the Mountain West to the Big East (for a moment) and finally here to the Big 12. During that time, he has had only two losing seasons and was close to leading TCU into the inaugural College Football Playoff last year. TCU went from 25.1 points and 345 yards per game in 2013 to 46.5 points and 533 yards per game in 2014. The scariest part is that TEN starters return making this one of the best offenses in the nation. Trevone Boykin threw for 3,901 yards with 33 touchdowns and 10 interceptions while also rushing for 707 yards and 8 touchdowns. Top running back from 2014, Aaron Green, ran for 922 yards and 9 touchdowns while also returning. Wide receivers Josh Doctson (65 catches for 1,018 yards and 11 touchdowns), Kolby Listenbee (41 catches for 753 yards and 4 touchdowns), and Deante’ Gray (36 catches for 582 yards and 8 touchdowns) all return as well. The defenses in the Big 12 better watch out for this incredible TCU machine. TCU’s defense has only five starters back from a unit that allowed 19 points and 342 yards per game in 2014. The defensive line has three starters back including defensive end James McFarland, who had 41 tackles, 7 sacks, 5 tackles for loss, and an interception. Nebraska transfer Aaron Curry also joins the fray. The linebacking unit has been hit hard by losses with the top three gone leaving this the most inexperienced part of the defense. The secondary has both Ranthony Texada and Derrick Kindred back from a group that allowed only 48.5% completions. The TCU defense is the top priority for Patterson and it would be surprising to see them struggle for long during the season. TCU opens with a road game against Minnesota before back-to-back home games against Stephen F Austin and SMU. The Big 12 plays a round robin schedule, which means TCU will face each team in the conference. TCU faces Texas (home), Kansas State (road), Oklahoma (road), and the biggest game against Baylor is also at home. TCU very well could run the table and make up for last year’s snub from the College Football Playoff committee. Baylor used to constantly finish in the Big 12’s cellar prior to the hiring of Art Briles. Since then, Briles has led the Bears to a bowl game every year since 2010 and double digit win totals in three of the last four years. Last year, Baylor nearly made the College Football Playoff, but were left out by the committee. Briles will have his most experienced offense since his first season at Baylor in 2008. There are nine starters back from a group that put up 48.2 points and 581 yards of offense. Gone is quarterback Bryce Petty (3,855 yards, 29 touchdowns, 7 interceptions, and 63.1% completion), but Briles is renowned for producing stellar quarterbacks. Seth Russell is ready to take his turn after throwing for 804 yards with 8 touchdowns and 1 interception while getting some playing time with Petty’s injury last season. Shock Linwood is back to run the ball after rushing for 1,252 yards and 16 touchdowns. The top two wide receivers return as well with Corey Coleman (64 catches for 1,119 yards and 11 touchdowns) and the speedy KD Cannon (58 catches for 1,030 yards and 8 touchdowns). The entire offensive line returns and Baylor should continue to put out points at will in 2015. 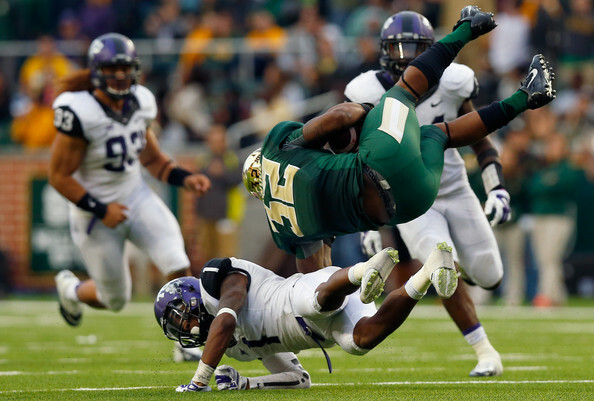 The defense for Briles will be his most experienced since he has taken over at Baylor. He has nine starters back from a group that allowed 25.5 points and 382 yards of offense per game. That was done with only four starters back for 2014 as well. The defensive line returns intact including the imposing Shawn Oakman. Oakman had 51 tackles, 11 sacks, and 8.5 tackles for loss last year, but is probably best known for his imposing stance in last year’s Cotton Bowl against Michigan State. Linebacker lost one starter, but does return Taylor Young, the team’s second leading tackler at 92. The secondary also returns all four starters from a group that allowed only 54.6% completions. Baylor has an easy non-conference schedule with games against SMU (road), Lamar (home), and Rice (home). In conference, Baylor has a brutal schedule to close out the year. The final five games are against Kansas State (road), Oklahoma (home), Oklahoma State (road), TCU (road), and Texas (home). That finish to the season could ultimately cost Baylor the Big 12 title, but they still have an excellent shot at getting to the TCU game undefeated to set up an unofficial Big 12 title game. Charlie Strong took over at Texas prior to last season after 16 years of Mack Brown at the helm. Strong instituted much more discipline, which resulted in some losses, but still guided the team to a 6-6 regular season before losing the Texas Bowl to Arkansas by a score of 31-7. The offense averaged 21.4 points and 337 yards per game in Strong’s first season. This year, seven starters are back including quarterback Tyrone Swoopes. Swoopes threw for 2,409 yards with 13 touchdown and 11 interceptions while also rushing for 264 yards and 4 touchdowns. Jonathan Gray may finally get his chance to get all the carries at running back after rushing for 637 yards and 7 touchdowns as the team’s second leading rusher. John Harris and Jaxon Shipley were the top two receivers last year, but have departed leaving Marcus Johnson as the top returning receiver. He caught 27 passes for 313 yards and a touchdown. The entire offensive line returns and the offense should perform better in 2015 with a year of Strong’s schemes under their belts. The defense returns only five starters, but the strength of Strong’s coaching tends to be on this side of the ball. Two linemen return including tackle Hassan Ridgeway, who had 43 tackles, 6 sacks, and 5 tackles for loss. The line gave up 164 yards rushing per game in 2014 and will probably improve on that in 2015. The linebackers are all gone leaving this unit very inexperienced, but Malik Jefferson is expected to start immediately as a true freshman. The secondary has three starters back led by safety Dylan Haines. Haines had 86 tackles to finish third on the team while also tallying 7 pass breakups and 4 interceptions. The defense gave up 23.8 points and 349 yards per game in 2014 and should have a similar year this time around as well. Texas has an interesting non-conference schedule with games against Notre Dame (road), Rice (home), and California (home). They face Oklahoma State (home), TCU (road), Oklahoma (Dallas), Kansas State (home), and Baylor (road). They also have a tricky road game at West Virginia. Strong has recruited well and should be able to get Texas back to a winning season this year. Oklahoma has been good under Bob Stoops, but only won a single National Championship (2000) during that time while playing in three others (2003, 2004, and 2008). Stoops has produced many double digit win seasons, but the lack of National Championship appearances in the last 7 years has left some weary. The Oklahoma offense has seven starters returning including quarterback Trevor Knight (2,300 yards with 14 touchdowns and 12 interceptions), but he may not be the starter. That could be Baker Mayfield. Mayfield started at Texas Tech in 2013 (2,315 yards with 12 touchdowns and 9 interceptions) where he had an excellent start, but decided to move on to Oklahoma. Whichever player is behind center, they will have running back Samaje Perine to handoff to. He ran for 1,713 yards and 21 touchdowns as a true freshman. Also returning are the top four receivers led by Sterling Shepard with 51 catches for 970 yards and 5 touchdowns. The offensive line has only two starters returning, but the unit as a whole should be able to match 2014’s output of 36.4 points and 465 yards per game. The defense under Stoops has been consistent with most years giving up points per game in the low to mid 20s and less than 400 yards per game. 2014 was no different at 25.9 points and 383 yards per game. There are six starters back and only one of those is on the line in Charles Tapper. Tapper had 37 tackles, 3 sacks, and 4.5 tackles for loss while the group allowed only 106 yards rushing per game. Three of the four linebackers return including Dominique Alexander and Jordan Evans. Alexander had 107 tackles, 1.5 sacks, and 4.5 tackles for loss while Evans finished 2014 with 93 tackles, 6.5 tackles for loss, and an interception. The secondary has two starters back in Zack Sanchez and Ahmad Thomas while giving up 276 passing yards per game and 56.3% completions. Expect another typical finish for the Sooners on defense. Oklahoma opens the year with Akron at home, Tennessee on the road, and Tulsa at home before a bye week leads into conference play. In conference, they will face West Virginia (home), Texas (Dallas), and Kansas State (road) early. The last three games consist of Baylor (road), TCU (home), and Oklahoma State (road). The Sooners could surprise this year if the defense improves, but Stoops’ teams have a tendency to underachieve a bit. Oklahoma State has three double digit win seasons since 2010 and have been to a bowl game each year since 2006. 2015 has a chance to produce another one of those double digit win totals. There are eight starters back on offense for the Cowboys from a group that put up 27.6 points and 379 yards per game. Daxx Garman threw for 2,041 yards with 12 touchdowns and 12 interceptions, but has opted to transfer. Mason Rudolph started the last three games and finished 2014 with 853 yards, 6 touchdowns, and 4 interceptions. Rudolph is expected to beat out JW Walsh and John Kolar for the starting spot. The top two running backs are gone with Ronnie Childs the top rusher returning from 2014 with only 294 yards and 3 touchdowns. Chris Carson arrives from junior college in the fall while coming back from injury is Sione Palelei. Wide receiver is not an area of concern with the trio of Brandon Sheperd, David Glidden, and James Washington returning after posting at least 450 yards and two touchdowns each. The offense should get back to putting up a lot of points in Stillwater. The defense struggled last year giving up 31.2 points and 432 yards per game with only four starters returning. The number of starters returning doubles to eight this year. The defensive line is hit the hardest with two starters lost, but still have two starters coming back in Emmanuel Ogbah and Jimmy Bean. Ogbah was excellent last year with 49 tackles, 11 sacks, 6 tackles for loss, and 5 pass breakups. Linebacker is strong with the duo of Ryan Simmons (96 tackles, 2 sacks, 10 tackles for loss) and Seth Jacobs (92 tackles, 6.5 tackles for loss, 2 interceptions) back. Three starters are back in the secondary led by Jordan Sterns. Sterns was best on the team in tackles last year with 103 while also recording 4.5 tackles for loss and 4 pass breakups. The defense should be better in 2015 with the amount of experience they have returning. Oklahoma State has a very easy non-conference schedule with Central Michigan (road), Central Arkansas, and Texas-San Antonio on the slate. In conference, they have Texas and West Virginia on the road, but get Kansas State, TCU, Baylor, and Oklahoma all at home. Oklahoma State has a shot of getting back to 10 wins in 2015 with just an upset or two. Bill Snyder retired in 2005 and handed over the program to Ron Prince. However, Prince led KSU to records of 7-6, 5-7, and 5-7 prompting Snyder to come out of retirement. Snyder has led KSU to at least a .500 record or better in the last six years including two double digit win seasons. The Wildcats have six starters back on offense, but the losses are heavy with quarterback Jake Waters as well as wide receivers Tyler Lockett, Curry Sexton, and Zach Trujillo all departing. The quarterback job is not settled and will come down to freshman Alex Delton, junior Joe Hubener, sophomore Jesse Ertz, or junior college transfer Johnathan Banks. Charles Jones led KSU in rushing last year, but had only 540 yards while scoring 13 touchdowns. The top receivers back are Kody Cook (20 catches for 251 yards and a touchdown) and Deante Burton (17 catches for 171 yards). Four offensive linemen return from a unit that scored 35.8 points and put up 422 yards per game. The offense probably will not match those numbers in 2015, but Snyder always gets the best out of his teams. The defense also has six starters back from a group that allowed 23.2 points and 369 yards per game. The line has two starters back in Jordan Willis (26 tackles, 4.5 sacks, and .5 tackles for loss) and Travis Britz (27 tackles, 3 sacks, and 2 tackles for loss). Linebacker has no starters back, which will hurt the defense, but three starters return in the secondary. Dante Barnett had 77 tackles, 4 tackles for loss, 8 pass breakups, and 3 interceptions last year. The defense will have another solid year under Snyder. Kansas State has an out of conference schedule comprised of South Dakota (home), Texas-San Antonio (road), and Louisiana Tech (home). They will face the TCU, Oklahoma, Baylor, and West Virginia at home while going on the road to play Oklahoma State, Texas, and Texas Tech. KSU should take a step back, but still be able to make a bowl game this year as well as pull an upset or two in the Big 12. Texas Tech began sparklingly in 2013 going 7-0 and reaching as high as tenth in the nation. An eight point loss to Oklahoma started a five game losing streak that ended with four consecutive blowouts. Texas Tech finished that season 8-5 thanks to a win over Arizona State in the Holiday Bowl, but high hopes for 2014 were dashed following a 4-8 record. Kliff Kingsbury needs to have a bounce back season in 2015. The offense has nine starters back including two quarterbacks who played last year. Davis Webb started the year, but was injured late in the season and finished with 2,539 yards with 24 touchdowns and 13 interceptions. Patrick Mahomes started the last four, throwing for 1,547 yards with 16 touchdowns and 4 interceptions. DeAndre Washington, who ran for 1,103 yards and 2 touchdowns last year, returns at running back. Washington also caught 30 passes for 328 yards and 2 touchdowns. Jakeem Grant (67 catches for 938 yards and 7 touchdowns), Devin Lauderdale (31 catches for 589 yards and 2 touchdowns), and Ian Sadler (23 catches for 336 yards and 2 touchdowns) all return at receiver with only the number two guy (Bradley Marquez; 65 catches for 821 yards and 10 touchdowns) departs. Four starters also return on the offensive line and the Red Raiders are likely to beat their 2014 output of 30.5 points per game this year. The defense has eight starters returning, but struggled mightily last year. With four starters back, the defense allowed 41.3 points and 513 yards per game. Those numbers were over 10 points and nearly 100 yards per game higher than 2013. Defensive end Pete Robertson led Texas Tech in tackles last year with 81 while also recording 12 sacks, 2.5 tackles for loss, and 3 pass breakups. Micah Awe returns at linebacker after tallying 69 tackles, 1 sack, and 2 tackles for loss. The secondary has all four starters back and should improve on their 253 passing yards given up per game in 2014. Overall, the defense should get back to 2013 numbers of 30.5 points and 419 yards per game. Texas Tech opens with Sam Houston State and UTEP at home before traveling to face Arkansas in their final non-conference game. In conference, they face TCU, Oklahoma State, and Kansas State at home. They will face Baylor in Arlington, Oklahoma, West Virginia, and Texas on the road. Texas Tech will need to pull a couple of upsets to reach bowl eligibility, but they certainly are able to do so. West Virginia moved to the Big 12 prior to the 2012 season and has seen some success. They have gone 7-6, 4-8, and 7-6 in their first three seasons while having some potent offenses. 2015 will be Dana Holgorsen’s fifth season with the team. Six starters are back for West Virginia on offense, but two of those will not be quarterback Clint Trickett and wide receiver Kevin White. Skyler Howard is expected to lead WV after throwing for 829 yards and 8 touchdowns (no interceptions) after starting the final two games. Rushel Shell ran for 788 yards and 7 touchdowns while Wendell Smallwood ran for 722 yards and 2 touchdowns with both of those backs returning. Jordan Thompson is the top returning wideout after grabbing 49 catches for 598 yards and 2 touchdowns. The offense put up 33.5 points and 500 yards of offense last year and may come up short of reaching those numbers this year with a new quarterback and the loss of White. The 2015 defense will be the most experienced under Holgorsen with nine starters returning. Two starters on the defensive line, but linebacker is where the top returnee is. Nick Kwiatkoski led the team with 103 tackles, but also had 0.5 sacks, 11 tackles for loss, and 4 pass breakups. The secondary has all four starters back as well as KJ Dillon (62 tackles, 0.5 sacks, 7 tackles for loss, 7 pass breakups, and 3 interceptions) at the Spur position. The secondary should be the best part of the defense this year. West Virginia has three non-conference home games to start the year with Georgia Southern, Liberty, and Maryland all going to Morgantown. Also going to Morgantown in Big 12 play will be Oklahoma State, Texas Tech, and Texas. West Virginia will have to travel to Oklahoma, Baylor, TCU, and Kansas State. West Virginia will be close to bowl eligibility this year and should get there with an upset in the Big 12. Paul Rhoads has led Iowa State to three bowl games in six seasons, but also has five losing seasons at Iowa State (two years of 6-7 records). Iowa State went 3-9 in 2013 and 2-10 in 2014. Rhoads will need to improve in 2015 if he is to keep his job in 2016 and beyond. The offense has seven starters back led by Sam B. Richardson and his top two wide receivers. Richardson threw for 2,669 yards with 18 touchdowns and 9 interceptions. He also ran for 421 yards and 3 scores. He will be throwing to D’Vario Montgomery (44 catches for 605 yards and 2 touchdowns) and Allen Lazard (45 catches for 593 yards and 3 touchdowns). A top running back will need to be found with Tyler Brown (109 yards) and Martinez Syria (47 yards and a touchdown) the top returning rushers behind Richardson. The offense will be guided by Mark Mangino in his second year. After putting up numbers of 23.2 points and 373 yards per game, Iowa State should be able to match those numbers on offense. The defense last year was the worst under Rhoads. The unit gave up 38.8 points and 529 yards per game. Now, six starters are back (five were back in 2014) and Rhoads’ work is cut out for him. The defensive line has Trent Taylor back (37 tackles, 2 sacks, and 3 tackles for loss), but adds in two highly rated junior college transfers in Bobby Leath and Demond Tucker. Linebacker has only Luke Knott returning, but he had 74 tackles, 3.5 tackles for loss, and an interception last year as a starter. The secondary is bring back three starters in Sam E. Richardson, Nigel Tribune, and Kamari Cotton-Moya. Cotton-Moya was the teams leading tackler in 2014 with 77 stops and was named the Big 12 Freshman Defensive Player of the Year. It is hard to see the defense not getting better under Rhoads this year. Iowa State opens with rivalry games against Northern Iowa and Iowa at home before a road test against Toledo. They open Big 12 play against Kansas at home in a game that could determine who finishes last in the Big 12. They also TCU, Texas, and Oklahoma State at home while facing Texas Tech, Baylor, Oklahoma, Kansas State, and West Virginia on the road. Iowa State usually gets a shocking upset or two against Big 12 foes and that should be expected in 2015. However, it will probably not be enough to get the back to bowl eligibility. Given the current state of Kansas’ football program, it is surprising to think they were one of the top teams in 2007 when they reached #2 before a loss against Missouri in the regular season finale. Kansas went on to win the Orange Bowl 24-21 over Virginia Tech. Since then, it has been downhill with Kansas having six straight losing seasons. Since Mark Mangino was fired after the 2009 season, the Jayhawks have not won more than three games in a season. David Beaty is now in charge of turning the Kansas football program around and it will be difficult in 2015. Kansas’ offense has not averaged more than 20 points per game in a season since 2011 when they hit 22.3 points per game. In 2015, there will be only four starters back for Beaty to work with. Montell Cozart (1,715 yards with 9 touchdowns and 6 interceptions) and Michael Cummings (701 yards with 5 touchdowns and 7 interceptions) back from 2014. Also with a chance to win the starting QB spot are TJ Millweard, Carter Stanley, and Ryan Willis. Corey Avery ran for 631 yards and 5 touchdowns last year, but was suspended for spring and kicked off the team in June. That leaves De’Andre Mann as the top returning rusher with 399 yards. Ke’aun Kinner transferred in from his junior college and is expected to get snaps as well. Wide receiver was crushed by losses with the top six receivers gone. Kent Taylor, who was one of the top tight ends in 2013, has transferred in from Florida. The line returns two starters and Kansas may not even match last year’s production of 17.8 points and 324 yards of offense per game this year with a new coach and schemes. Defense is also an issue for Beaty in year one. He has only three returning starters from a unit that allowed 33.3 points and 453 yards per game in 2014. Ben Goodman is the only starter returning on the line after recording 21 tackles, 1 sack, and a tackle for loss last season. The other two starters returning are at linebacker with Jake Love (53 tackles, 3 sacks, and 6.5 tackles for loss), and nickelback with Tevin Shaw (36 tackles and 2.5 tackles for loss). The defense should be in store for another rough year. Kansas opens with South Dakota State and Memphis at home before a bye week leads into a road game at Rutgers. Their Big 12 slate opens with a road game at Iowa State that will probably determine the bottom team in the Big 12. It is hard to see Kansas getting more than a victory or two in 2015 and Beaty has a lot of work ahead of him if Kansas is to get back to being competitive in the Big 12. The Big 12 looks like a two horse race between TCU and Baylor for the title. However, the second tier of Texas, Oklahoma, Oklahoma State, and Kansas State could surprise with a few upsets or the top two do worse than expected. Texas Tech and West Virginia will be battling for bowl eligibility while Iowa State and Kansas will play to stay out of the cellar. Below is the predicted order of finish. Check back on Tuesday, August 4 for a preview of the ACC’s Coastal Division. It was an ugly game between the Kansas State Wildcats and Texas Longhorns, but the Wildcats will not care as they won 23-0. It was Texas’ first shutout loss since 2004 when they were blanked 12-0 by Oklahoma. It was Kansas State’s first shut out since 2003 when they beat Iowa State 45-0 on November 8. Texas began the game with two false start penalties on their first drive and ended up punting. The Wildcats had a first and goal from the Texas two yard line, but were unable to punch the ball in and settled for a 19 yard field goal from Matthew McCrane. McCrane added a second field goal on the next drive from 30 yards to make it 6-0 Wildcats. Texas’ first series in the second quarter was their best chance to get points. They started at the Wildcats’ 40 yard line and quickly moved to the 16 yard line. However, a holding penalty and sack took them out of field goal range and they punted it away. With less than three minutes to go, DeMarcus Robinson ran in from 3 yards out when he bounced to the outside after finding no room up the middle. That made it 13-0 and was more than enough on a day when Texas’ offense could not get anything going. Kansas State was forced to punt on their first drive of the third quarter and Texas appeared to finally have some continuity on offense. They were at the Wildcats’ 43 yard line when D’Onta Foreman’s pitch to Jaxon Shipley on the reverse was fumbled and recovered by Valentino Coleman of K-State. The Wildcats settled for a field goal from 38 yards out, courtesy of McCrane, and a 16-0 lead. The ensuing drive by Texas had the chance to get them back in the game. On fourth and one from the K-State 14 yard line, Johnathan Gray ran to the left and was called down for no gain. The call looked incredibly egregious, but it stood and the Wildcats would take over. They ended up going 86 yards in 10 plays with Charles Jones running in from a yard out to make it 23-0. 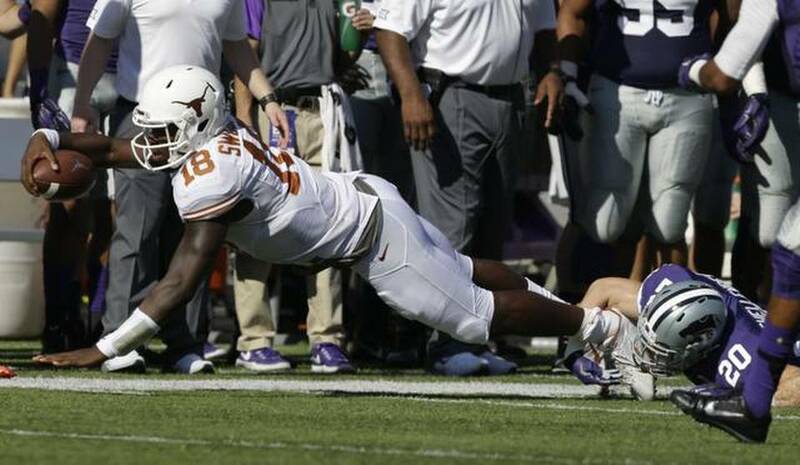 It was a long day for Tyrone Swoopes, who had looked excellent in the previous two games. He was 13 of 25 passing for 106 yards and was the leading rusher with 31 yards on 8 carries. Johnathan Gray had 10 carries for 24 yards while Malcolm Brown ran 6 times for 21 yards. Freshman D’Onta Freeman had 3 catches for 14 yards. John Harris was the leading receiver with 3 catches for 42 yards while Jaxon Shipley had 4 catches for 25 yards. Jake Waters went 19 of 30 for 224 yards and no turnovers. He ran 7 times for -1 yard, but that was due to a sore shoulder he suffered last week against Oklahoma. DeMarcus Robinson ran 16 times for 50 yards and a touchdown while Charles Jones had 13 carries for 49 yards and a score. Backup quarterback Joe Hubener had 5 runs for 46 yards late in the fourth quarter with the game well in hand. Tyler Lockett was the leading receiver with 8 receptions for 103 yards. Deante Burton caught 4 passes for 55 yards and Curry Sexton had 4 catches for 36 yards. Neither team was impressive, but Texas looked horrendous on offense. They finished with 196 yards of total offense while Kansas State had 367 yards. There was little continuity for Texas and never got in rhythm. Texas (3-5, 2-3) needs to win three of their last four games to reach bowl eligibility. They face Texas Tech next week on the road before playing West Virginia (11/8), going to Oklahoma State (11/15), and facing TCU at home on Thanksgiving (11/27). Texas is facing the stark reality of not playing in a bowl game for the first time since 2010. Kansas State (6-1, 4-0) continues to make their case for a possible spot in the playoffs. However, they have plenty of hurdles left in TCU, West Virginia, and Baylor all on the road before they should even begin to think about that. They have another home game next week against Oklahoma State on Saturday.